Laura and I have had the wonderful experience of spending time this winter in Hawaii, on the island of Maui. It has been so healing. People are drawn to Hawaii as a great place to unwind from their stressful lives and embrace the balancing energy of the islands and ocean. You are surrounded by the sacred the rhythm of the sea, the powerful Haleakala volcano rising up to the sky, the gorgeous flowers and in the stimulating tropical air. There is a mythical healing power here, embraced by the Hawaiian shamans, the Kahunas. Each day Laura and I go to the beach for sunset. The sunsets in Hawaii are unlike anywhere else on earth… and absolutely mesmerizing. We wait patiently for the final seconds for that magical moment of a green flash as the sun disappears. At that moment a chorus of conches sounds all around us. It is a modern day ritual to blow the “Pū” (conch) to say goodbye at sunset to end the day and to say Mahalo (thanks). Laura surprised me with a beautiful conch with an amazing sound so that I could join the ritual. The ceremonial Hawaiian practice of blowing the conch shell dates back to the ancient times and continues in many present day traditions. Blowing the Pu is a deep part of Hawaiian culture. Blown in accordance with Hawaiian protocol, it is a call to the divine announcing the official beginning of a sacred ceremony. I decided to look at the history of the conch, and how it was used in cultural rituals in other parts of the world. Her is some of my findings. Throughout the ancient Americas, conch shell trumpets were blown to announce significant earthly events, including the arrival of dignitaries at state functions, on the battlefield as a signal to engage the enemy or otherwise direct the regiments, and during religious rites to accentuate the peak spiritual moment. 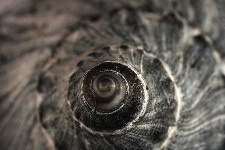 The conch shell also had long-standing symbolic associations with the watery underworld and was connected to certain deities. At Teotihuacan, images of conch shells adorned buildings whose decorative narratives indicate their association with agricultural plenty and the gods’ place of Creation. At Teotihuacan and among various peoples of West Mexico, conch shells denoted high status and special spiritual power, frequently being found in burials of the elite and adorning figures to denote a shaman’s supernatural powers. The Aztec deity Quetzalcóatl, the god of wind, wore a cross-sectioned conch shell as his special emblem, and members of the Mexica elite also wore the wind jewel as a proclamation of authority. Conch shell trumpets were fashioned from the natural shell or replicated in ceramic, as is this example. Shell trumpets are especially plentiful in the shaft tombs of West Mexico where they were intimately associated with elite status and shamanic power. They often are illustrated being played by persons depicted in the anecdotal sculptures for which the region is famous, these sculptural narratives illustrating ballgames, funerary processions, accession rites, and many other communal events of social and religious import.